Microsoft Corp. said a technical snafu has likely caused the loss of contacts, photos and other personal data for users of the T-Mobile Sidekick, a mobile phone for which it supplies software and online services. Microsoft servers are to blame. Happens at a time when Microsoft is trying to revive its mobile portfolio and Windows Mobile. Cloud computing now seems vulnerable, esp. after Aug 31 Gmail outage. Deutsche Lufthansa AG, which stumbled badly with previous efforts at onboard communications connectivity, on Monday is expected to unveil plans to provide long-distance passengers with the most extensive array of cellphone and Internet services available on any airline, according to people familiar with the matter. It's reported that the Internet service (FlytNet) will be fast enough to let users stream video. Panasonic is providing the tech. It's a heady proposition with costs for upgrading each plane to range from $100K to $250K. The calls will be around $3 a minute, while the Internet connection will be about $12 per hour, or $22 per day. Lufthansa had previously used Boeing's Connexion service, which Boeing eventually shut down in 2006 after a $1 billion investment. In its place, a new generation of services is starting to take hold—services like Twitter and Facebook and countless others vying for a piece of the new world. And just as email did more than a decade ago, this shift promises to profoundly rewrite the way we communicate—in ways we can only begin to imagine. Why not look beyond the Web 2.0 social media phenoms Twitter and Facebook, which have their own problems (fake profiles, time wasting)? This story cites the explosive (31% jump to 300 million users) growth of social media. E-mail is broken because of the reluctance to rein in the spammers and malware senders. Cloud computing (utility computing via virtualization) quiz. Buzz topics: Banking-rise of mobile use is predicted, but the security patches released for the iPhone shows that malware will present a security problem. Mobiles-MIDs (mobile information devices) offer another option to the converged smart phone. Mobile shopping-GPS aware means contextual adds, and again the problem of security and privacy. Engadget provides the pricing, at least according to their anonymous tipster. "AT&T's going to charge $19.99 a month for unlimited use unless you've got internet or landline (ironic) service with them, in which case you'll pay $9.99. If you've got both internet and landline accounts, it's free." The idea of a femtocell is to have a broadband-connected tiny base station in the home that allows an existing cellular handset to work without any modification. Sprint pairs its femtocell with an unlimited call options ($100 purchase price plus $5/mo for the base station's use and $10 additional/mo for unlimited calls). Verizon offers just the signal-strength improvements ($250). T-Mobile employs UMA, which requires one of many dual-mode UMA handsets that the company offers, but works over plain Wi-Fi. I wonder if this will solve the problem that iPhoners have in San Fran and other user-intensive areas. Probably not, if I can make a guess. Three weeks ago, I got a call on a friend's iPhone while in the middle of a desert; cell phone coverage had come to Burning Man. By contrast, several calls I made last night to my parents from my San Francisco apartment were dropped and a subsequent connection became garbled. Record: Cell phone coverage improves on the Danforth Campus. Several cellular towers and antennas were installed on campus by carriers, and the University also constructed a Distributed Antenna System (DAS) to address in-building cellular reception in Simon Hall, the Knight Center, the Danforth University Center and its underground garage. The DAS uses antennas placed throughout buildings to capture and relay cell phone signals through interior space. With positive and negative reactions to Google's new Android platform for mobile devices beginning to emerge, IDC analyst Chris Hazelton said Android could stimulate widespread Web access. He also said the open-source Android platform stands a "better chance of becoming a widely adopted system for mobile devices" than Linux has for PCs. This may be a wrong move. The need for ubiquitous Wi-Fi has been slow coming, but it will come. The iPhone only really operates as an online device reliably with a Wi-Fi connection. There will be more handheld devices with Wi-Fi, and if Google build an ad-driven revenue model, there will be the incentives to have Wi-Fi in at least the commercial districts of a city. This is a free service covering a 20-block area from Times Square to Central Park, and across 6th to 8th Avenues "that will deliver news, sports, and entertainment free of charge to users of cell phones, laptops, and other devices." Should or shouldn't Google buy Sprint? I hate this slide show format by eWeek, but I guess they're able to show more pages of advertising in the process by doing this. What follows is a summary plus my take on this topic. This move essentially makes Google a player in the cell phone market. It puts them in a position to come up with a product to their liking without carrier interference, which is where the iPhone suffers. They can develop the suggested ad model that would make this cell phone very inexpensive or free depending upon the subsidy from the agreement to view ads. Very importantly, with this new wunderdevice, the can effectively compete with Yahoo as *the* mobile search engine. Google and Yahoo both play a role on the iPhone. You can bet won't be on the gPhone. Buying Sprint, and 700 MHz spectrum puts them on track to possibly be the largest carrier eventually. This is assuming that the gPhone will receive overwhelming interest with the public. Since Google has created the Open Handset Alliance (OHA), there is a opening for developers that the iPhone doesn't have. Google is not necessarily interested in selling minutes, or selling services--they want market dominance to sell ads. The revenue generating model changes in way that Verizon Wireless and AT&T can't compete. With a $45 billion market cap, Sprint could prove to be too big a purchase for Google. YouTube and DoubleClick at nothing compared to this company. Sprint’s inability to make the ClearWire deal work might show that it might not work well with Google either. This might be the one false move that shows this company’s arrogance by dominating a market. The OHA may fall by the wayside now that two members are now joined together. Essentially, it comes down to what the plans for the gPhone are all about. If Google can come up with a device that catches fire, being boosted by Sprint's infrastructure could take this device to heights never seen. If their collaboration with Sprint doesn't take hold, and leadership becomes a problem, it could be a long and difficult journey. But, except for the iPhone the other carriers are not coming up with any phone worth talking about. It you want to make a splash in the mobile world, choosing the iPhone as a target is what you have to do. It seems this is what Ed said during his recent Q1-08 conference call yesterday. All the Gizmodo poster says, this replacement for frankengarnet is needed now, not a year from now. The iPhone and iPod Touch are lacking the 3rd-party app support that has made the Palm OS devices very attractive. It was mentioned (was it by Jobs?) that the reason the iPhone didn't have 3rd-pary apps was that this might endanger the AT&T network, which doesn't make sense considering the Treo's viability as a smartphone. I tend to think that the reason for delay is the old problem of working out the sync'ing problem with PCs and Macs. I would bet that the Foleo was designed to allow the earlier release of the new linux-based Palm OS. We'll never know, and I guess will just have to wait. "We are less than a decade away from the medical lab the size of a sugar cube. We are less than a decade away from a truly non-invasive blood glucose and heart monitor." Alan Reiter pointed this company out to me. It would only make sense that Alan would have a connection to Philippe given that he created the first camera phone system back in 1997. At this time, Philippe might still be on his journey across the Pacific on his sailboat trying to set a new speed record. Speaking of MEMS, I'll have to catch up on the podcasts produced by Marlene Bourne which she calls the Bourne Report. Today's WSJ article "Newest Laptops Tap Intel For Faster Links," reports that 230 new laptops will be marketed by the Intel processor brand "Centrino Duo." This replaces the code name Santa Rosa which is the 4th generation Centrino platform. [This will] offer a slightly faster version of Intel's Core 2 Duo microprocessor chip. But there are two other elements: a set of accessory chips that can display more realistic computer graphics, and Intel's adoption of draft industry specifications called 802.11n in wireless chips that send data at about five times the speed of today's Wi-Fi technology. Just to recap, Centrino is the platform-marketing initiative by Intel that denotes the use of all 3 of its chips--CPU, mainboard chipset, and wireless--in the design of laptops. OEMs that use only the processor and chipset carry the Intel Core label instead. 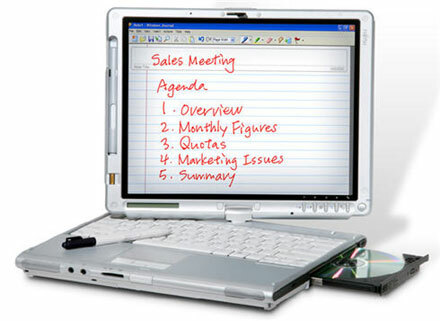 The photo here shows Fujitsu's $1750 LifeBook T4220 convertible laptop/tablet with Centrino Duo. Notice that they prominently display the optical drive which as been absent in many Tablet PCs. Dell is also planning on offering 2 new Centrino Duo laptops in its Latitude line of notebooks. These supposedly will be 15% faster and will have up to an hour and a half more battery life. It is expected that the Santa Rosa platform will be updated in the first half of 2008 with the new 45nm Penryn processor replacing the current generation of 65nm Core 2 processors (Merom). 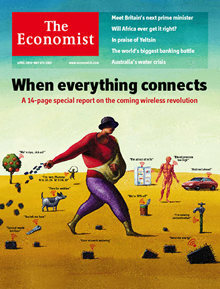 With this post I'll begin to summarize and discuss some of the salient points from the special report on wireless tech entitled "When everything connects" in the April 28 issue of The Economist (online subscription required). I'll start off with the podcast featuring their technology correspondent, Ken Cukier. Even though the interviewer begins by talking about the "almost unlimited developed of wireless technology," Ken correctly points out that the wireless tech is not really new, it's just that barriers to implementation and integration such as cost, lack of business processes or services tailored to support all the possible applications are all part of an immature technology ecosystem that I'll discuss below. However, with the wide acceptance of the mobile phone--"today, almost 3 billion people use a phone...the industry is adding 1.6 million new subscribers each day"--other areas of wireless tech have benefited mostly due to the economies of scale. Now that 1 billion phones are being shipped per year, many resources can now be applied to other areas of wireless tech. Such applications as machine-to-machine communication, sensor networking, medical wireless monitoring are "absolutely taking off." The key trend is that as the microprocessor is paired with the wireless radio, the same cost reduction, size reduction and innovation is seen in wireless tech as that seen in the computing industry. What are the barriers to development at the present? First, there is no industry to supply these various applications such as using a wireless connection to adjust the lighting in a building. The major business maintenance companies such as GE, Honeywell, Philips are in the process of instituing these services, but are not there yet. Second, the cost is still prohibitive. A wireless module might cost $4 at scale, but once it's down to 10 cents "it's gonna happen everywhere." The time scale for this is about 5 to 10 years, since these ideas are just entering the planning cycles of these companies. The benefits not only include saving energy, but there will be new uses that are not even imagined yet. For the general consumer, these new services will required special marketing and demonstrations just to explain them. Consider the difficulty that the cellular carriers and other companies have faced trying to get the message across about all the advanced features available on smart phones such as GPS, mobile search, and even SMS for some. Consumers are already familiar with wireless communication services for cars such as the OnStar service, but there are plans that go further than this. Wireless monitors can be used to provide predictive maintenance, or preventive medicine when talking about health care, or in the case of the automobile example, even act as black boxes similar to those used on aircraft, to provide information about who is at fault in the case of an accident. This brings up the very important issue of privacy. And this certainly has implications for the healthcare field. Again, it will take some explaining to the consumer to ask them to pay for map services or some other benefit they've never realized before. It might be offset by advertising, for instance, in providing coupons as you drive through a certain commercial district, but this could be seen as yet another unwanted distraction in a already infomation-glutted world. The thing about the The Next Great Thing is that no one can predict it. Ken uses the analogy of the electric power grid which was originally developed to power light bulbs in everyone's homes. But, it was the availability of the electric socket that was the killer app in providing development of various appliances which are now considered necessities. 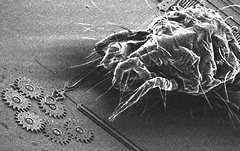 Another analogy drawn from the past is made about the electric motor, which due to miniaturization and decreasing cost has found its way into many varied and unimagined applications such as the toothbrush. This ubiquity could be the fate of wireless tech, where you have "the fridge talking to the kettle," but it also will find its way into transformative uses, especially in medicine and health care which I'll explore in future posts. But, it's important first examine the development of wireless tech in the broad context, which is what I wanted to do with this post. Wireless handheld converged devices, some in the form of a phone or a Web tablet, or in some form not even dreamed of yet, while allowing you to monitor your blood glucose, might also be expected to download and view video, provide speech recognition, etc. I guess some time soon, I'll also have to survey battery technology.